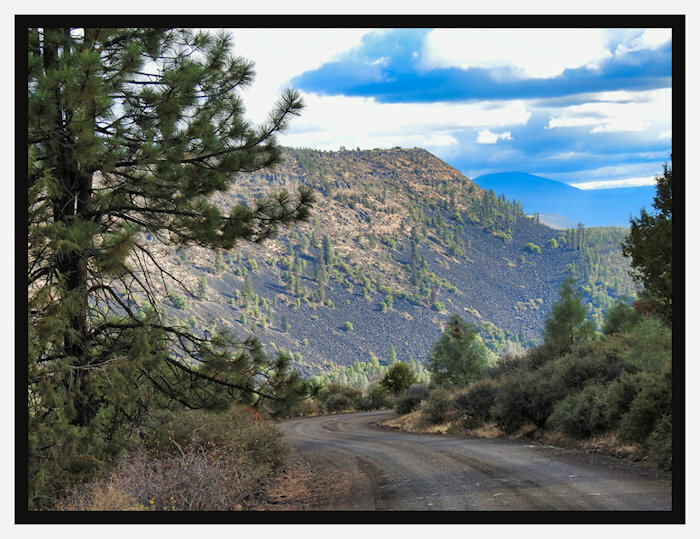 A few years back we were on a drive from Redding to Alturas. We stopped at an Overlook on Highway 299E where you can see the Pit River Falls. While we were checking out the distant view of the falls I noticed a tiny speck that might have been a small boat go over the falls. At first I thought it must be some sort of horrible accident. 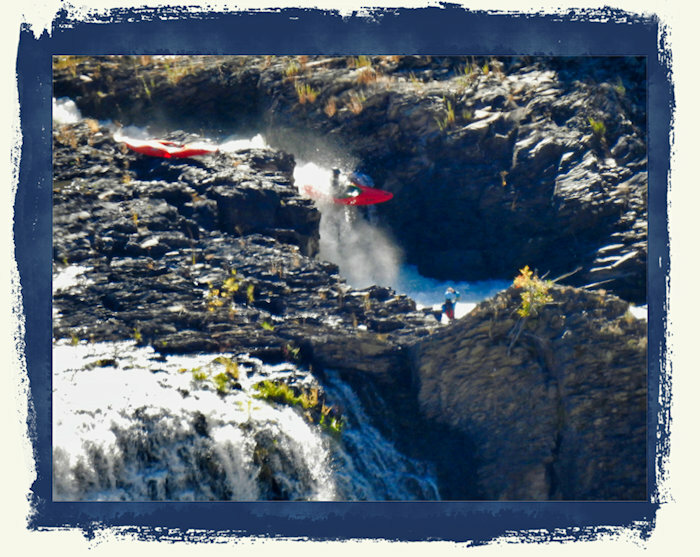 Then I realized it might be someone deliberately going over a waterfall! But it was so far away I couldn't really see what exactly was going on. Fast forward to 2018, a Nikon Coolpix p900 camera with an 83x zoom lens and a daytrip to that same overlook. Taking photos and videos of highly active outdoor sports is always a challenge for me due to mobility issues. I can't chase the action. I have to find my vantage point, get set up, and let the action come to me. 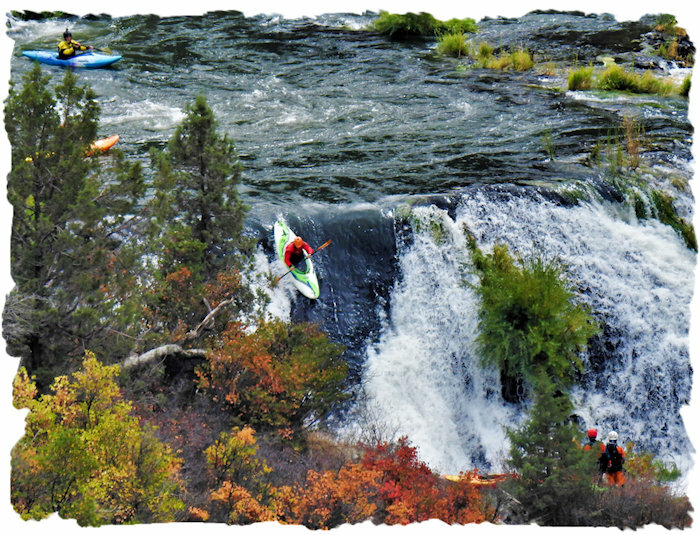 A good example of this kind of outdoor photography is taking photos of kayakers running rapids or going over a waterfall. Often finding a spot to shoot from that I can physically reach is the first hurdle. 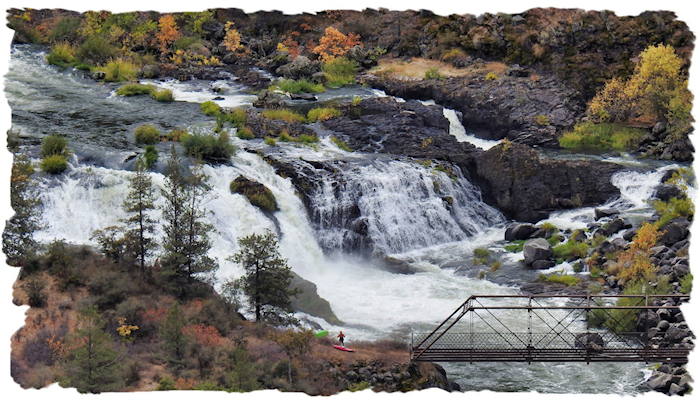 Pit River Falls: At the town of Fall River Mills, the Pit River is joined by Fall River and then starts cutting a canyon through a volcanic plateau in eastern Shasta County. 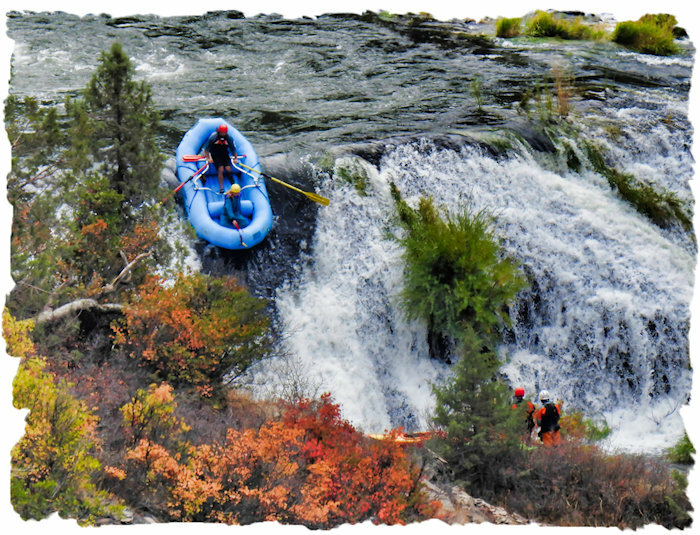 Popular with kayakers and thrill seekers, the very scenic Pit River cuts to the bottom of the plateau over 7 miles of mixed rapids and then drops onto a lower basin over the Pit River Falls. The Pit has a basalt riverbed which is unique in California and very visible as exposed by the falls. The falls itself is about a 40 foot plunge over very rough rock. The photography vantage point I have chosen is the Highway 299E Overlook, just west of the town of Fall River Mills. There is a great view of the canyon and the Pit Falls, but the highway Overlook is still at least half a mile away from the action. To see the kayaks clearly you need a good long zoom camera or binoculars. At the 299E Overlook there is ample parking, wheelchair access to a walkway along the rim, a picnic table, but alas, no rest rooms. Note: The closest ADA restrooms would be at the BLM Pit River Campground (a lovely photo spot) further west off highway 299E, which also happens to be the 'take out' location for most kayakers and a good location to get some 'shoot the rapids' shots. The campground is often full if it's a kayak day, but is otherwise uncrowded. In the autumn this particular area is very vivid with colorful foliage and worthy of a picnic. 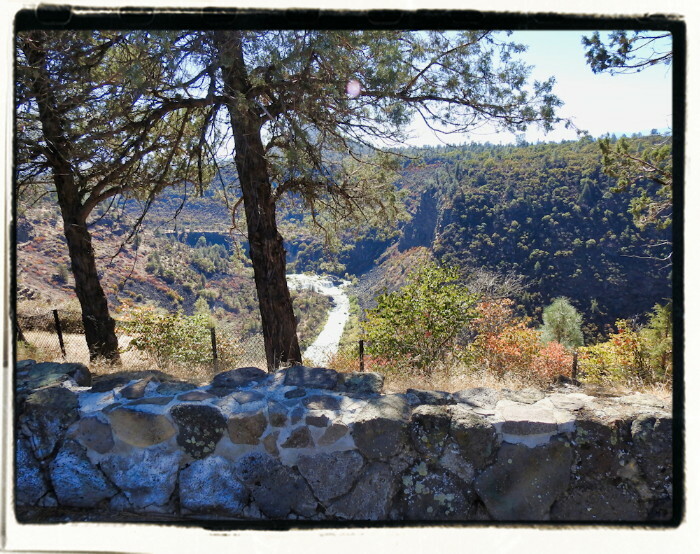 From the 299E Overlook you can see there was once a railroad in the canyon that went across a bridge over the Pit River just below the waterfall. 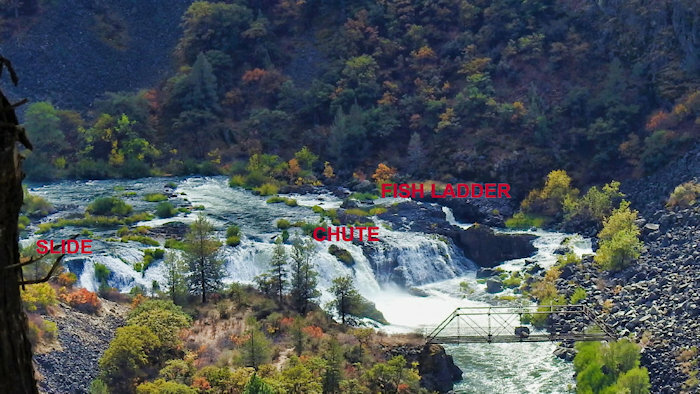 In theory, a very able person could hike to roughly the base of the falls from either side of the river. The bridge framework itself is quite unsafe to cross so this is NOT a 'through hike'. Plus, at the base of the falls you may not be able to position yourself to take good photos even if you did arrive in time to see kayakers making their run. Stick to the 299E overlook if you have mobility issues and let the kayakers scramble around over the lava rocks! From the 299E Overlook and using a long zoom camera (or binoculars) you can bridge the distance to the falls and get really close to the kayak action without any hiking. And frankly, I think the photo vantage point is better from the Overlook than at the base of the falls, based the kayaker river videos I've viewed. Really! Next, while you can get great photos of the waterfalls and river most days, if you want to photograph any kayakers, you need to find out if the river is 'runnable'. Weekends are the most likely times for kayaker groups to show up. Groups give you multiple chances to sang a really good photo. If you stop by the BLM Pit River Campground before going to the Overlook, you'll know if there are kayakers making runs as it is the 'take out' spot. 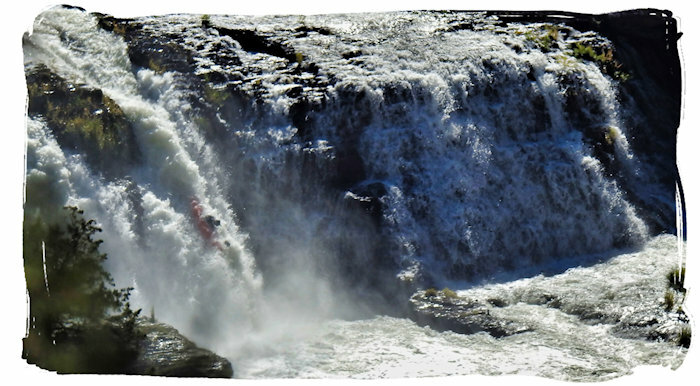 With the long zoom, like a Nikon p900 (83x) or Nikon p1000 (125x), you can get good photos of the kayaks and rafts going over the falls - and you won't even get wet! These photos were taken in October 2018 with the Nikon Coolpix p900 at the maximum optical zoom (not digital zoom) range for best sharpness. If I had more photography experience, I might have gotten sharper shots using manual or Program camera settings, but since the photo opportunity is very, very brief, I used 'Auto' setting and the bird setting for bursts. Kayakers seem to arrive at the falls sometime between 10am and noon. We set up my photography gear at the Overlook around 10am, added some comfy camp chairs and waited. You may want to come earlier in case the light and action is better, but 10-12 seems pretty productive. Good photos come to those who wait! The Saturday of the first October release was somewhat cloudy. This was actually an advantage in terms of photography. Sunday was clear and bright - and much more difficult in terms of photography with all the whites from the water and sun reflections. On Sunday, we came back to the 299E Overlook by 10am and again set up our gear and waited for the kayakers. It was quite bright and sunny, but we were rewarded with some brave kayakers making the more difficult runs over the center and right sides of the falls. It was definitely worth the effort! 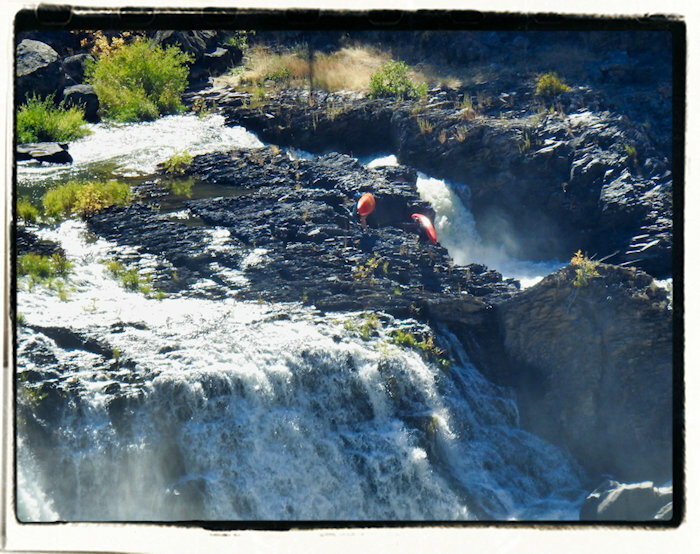 I was able to get both still and video shots of kayaks going over various sections of the falls. Even though my photos are hardly super-duper, I was quite thrilled to be able to get so visually close to the action from so far away. The Sunday videos in the bright light did show some heat distortion, and certainly the still photos that sunny day were not as good as Saturday's due to the different light conditions. But I was happy with the results. Kayakers tend to make the Pit run in small groups. I imagine this is for both camaraderie and safety as the falls 40 foot drop can injure people. 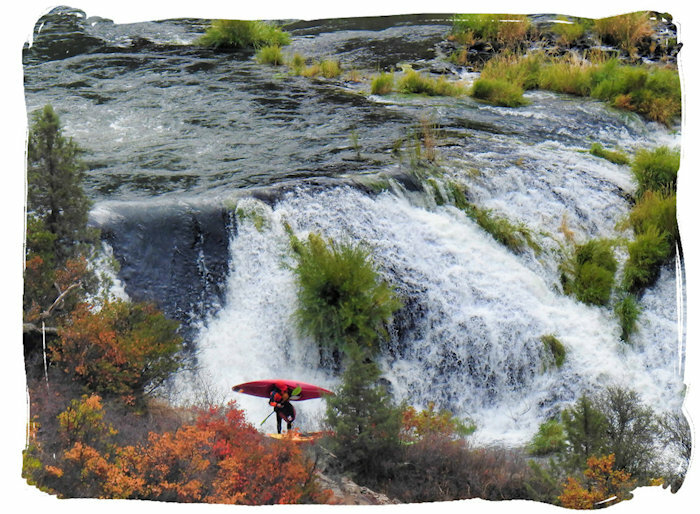 Most kayakers seem to try to make more than one run. It is not unusual for people to portage their craft back up to the top and do another run over the falls without having to go all the way down to the Pit River Campground, load the kayak back on the car and drive all the way back to the river entry point. On Kayaker weekends, the BLM Pit River campground is often full. So, when we were done photographing for the morning, we drove east from the Overlook to Fall River Mills and picnicked at the Fall River Lake, just north of town. If entering Fall River Mills driving from the east, take Long St (just before the bridge) and go north. There is a PG and E Day Use Area along the lake. 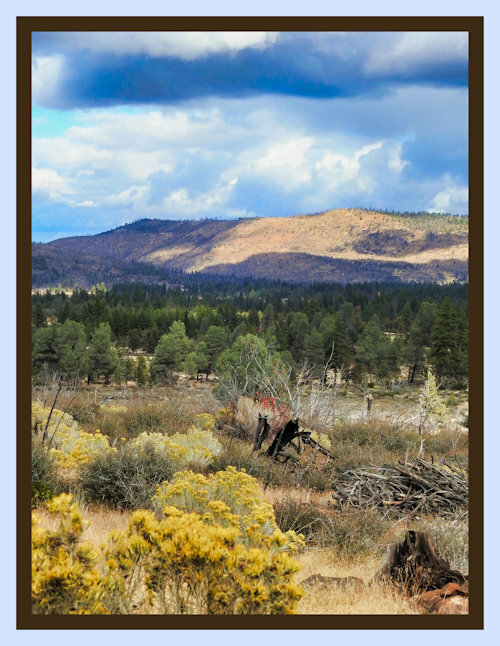 Most of the picnic areas there are wheeler accessible so pick one that pleases you and enjoy the view. After lunch we drove into Fall River Mills and took Main St south to the Cassel Fall River Rd. It's quite a scenic drive back to Cassell. On this occasion, we took a Forest Service road (36N18) and went south off the Cassell Fall River Rd (which goes to Cassell and then Highway 89). This is where having USFS maps come in handy. We could have followed USFS roads to Highway 44, following the Hat Creek Rim. But this day we took the Bidwell Rd cut-off going west which goes down the face of the Hat Creek Rim and down past the Hat Creek Radio Observatory until we reached Highway 89. The rim area is very photogenic. Then off to Burney for dinner at Anna's Country Kitchen.